Examination of probate inventories has shown that most books in this period were in the hands of the clergy in Devon but they had difficulties in maintaining their libraries during the Civil War and Commonwealth. One cleric whose library appears to have been spared and indeed still survives in Tiverton today is Richard Newte (1612-78) rector of Tiverton. He was the son of a lawyer who became town clerk of Tiverton in 1615. Admitted to Exeter College, Oxford he showed himself a skilled linguist both in ancient and modern languages and became tutor and lecturer in Hebrew. About 40 of the 70 volumes dating from the period when he was in Oxford reflect his work as a Biblical scholar, including lexicons and grammars of Hebrew, Chaldaic and Syriac. There are also books of doctrinal controversy and editions of the church fathers, often neatly underlined and annotated by Newte. There are also more general works, such as the Colloquia of Erasmus, Thomas Fuller's History of the holy warre (1638) and, one of the earliest items in the library, Ptolemy's Geographiae opus (Strasbourg, 1529). Other clerics did not fare so well. 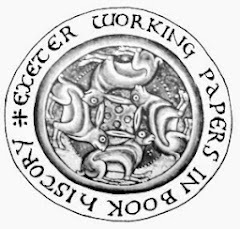 The ecclesiastical historian John Walker (1674-1747), born in Exeter, gives details of a number of ejected clergymen in Devon who lost their libraries. After the sequestration of James Burnard of Awliscombe, "a party of horse from Lyme plunder'd his goods, and sold them before his face, rifled his study also, which was a valuable one, throwing his books about the house, tearing them in a shameful manner." For a while Burnard was imprisoned in Hemyock (Walker 1714, 197). Sometimes the books fell into the hands of the intruding ministers. The goods of Daniel Berry of Knowstone were put up for sale "his books only excepted, which were of good value; and these they bestowed upon Mr. L- S-, the famous Independent preacher, who some time lorded it at Exeter with more than prelatical rigour. Which great zealot, as he had not the conscience at first to refuse them, so had he never after the honesty to restore the value of one farthing for them; tho' there were no less than nine horse loads of them, and the poor family reduced to very great extremities. I have been also informed, that the poor gentleman begg'd but one of his books again, and was denied it!" (Walker 1714, 193). Others similarly deprived include Thomas Jones of Offwell (p.280), Richard Raynolds of Stoke Fleming (p.340) and Henry Smith of Cornwood (p. 355). The gentry also suffered. Many of Sir William Pole's manuscript collections were lost in the Civil War. After the Restoration in 1660 many of the ejected ministers were reinstated and clerical libraries were established or strengthened during this period. There are several notable examples surviving in Devon most of which have their origin or period of most active development in the later 17th century. Richard Newte died in 1678, being succeeded as rector by his son John (1656-1716). Educated at Blundell's School, Tiverton and Exeter College, Oxford, he shared his father's love of Hebrew and the classical languages, acquiring a Hebrew lexicon in 1678. However his main interest was recent history. He bound his collection of tracts, together with those acquired by his father, into sixteen volumes in about 1709 and an analysis of the dates of the imprints shows that in the 1680s he was acquiring some fifteen pamphlets a year to follow the issues of the day, as opposed to his father who had acquired only about two per annum. He was a high-church man, opposed to both the Catholics and the Dissenters, as is shown by his choice of works for his library and his occasional annotations. Several times he ventured into print. In 1696 a new organ was dedicated at Tiverton and Newte preached a sermon on the occasion. After his "organical devotion" was attacked as Popish he had On the lawfulness and use of organs in the christian church produced for him by the London printer Freeman Collins in 1696, to be sold by Humphry Burton, bookseller in Tiverton, a second edition appearing in 1701. Also sold by Humphry Burton during this controversy was A treatise concerning the lawfulness of instrumental music by Henry Dodwell, a notable high-church man and probably a personal friend of Newte. Another work by Newte A discourse showing the duty of honouring the Lord with our substance. Together with the impiety of tithe stealing was published in 1711 after a law case had provided the author with bitter personal experience. He cited many of the works in his own collection to prove that tithe-stealers were among the devil's instruments, together with atheists, deists, quakers, republicans, anabaptists and others. He bequeathed his library of some 250 volumes assembled by himself and his father to the rectors of the three Tiverton portions to form a permanent parochial library for the use of the clergy of Tiverton and the masters of Blundell's and Chilcott's schools. (Welsford 1975). The Totnes parish library is the oldest surviving parish library in Devon, and indeed one of the oldest in the country, being established by the gift of Gabriel Barber in 1619. He presented the sum of £35 to the mayor of which £10 was to be employed towards the procuring of a library. An analysis of the dates of the imprints shows that it was regularly added to until the period of the Civil War, when it contained some 250 volumes. It seems to have been well cared for, many of the volumes still having plain black calf bindings from that period. The collection was moved from the church porch to William Tillard's house in 1646 until some shelves were eventually provided for the volumes in the old vestry. There they remained with only about 20 volumes being added after 1650 until they were replaced in the church porch in the 19th century where they were subject to damp, worm and neglect until rescued by Exeter University Library in 1967. The main content of the collection is theological and the earliest item is Haymo's commentary on the epistles of Paul, published in Cologne in 1529. (Evans 1982; Worthy 1875). Barnstaple's library owes its origin not to a cleric but to a lawyer. John Dodderidge (1610-1666) was recorder for Barnstaple and a member of Parliament for the borough in 1646, being excluded in 1647, after which he retired. He was the author of various legal works and a member of a family noted for its learning, the most famous member of which was probably Sir John Dodderidge (1555-1628) member of Parliament for Barnstaple, solicitor-general to James I and one of the founder members in the 1580s of the Society of Antiquaries, other members of which were William Camden, John Stow and Richard Carew, the historian of Cornwall. In 1664 John Dodderige presented 112 volumes to Barnstaple as a free library. These were largely Latin folios on theology but, despite their limited usefulness to the townsfolk at large, the gift was greatly appreciated and, according to the library's register books, "This library was begun to be builded by the Corporation of Barnstaple in the year 1665; and finished in 1667 by Richard Crossing, John Lovering and John Martin, merchants, executors of that worthy and pious benefactor... The foundation thereof was part on the churchyard; and about sixteen feet thereof upon the garden wall of John Frost and Nicholas Thorne of Barnstaple; who are to have a wheat-corn a year for granting the same; to be paid to them by the mayor and aldermen, for the time being, for ever." The register book includes details of the various benefactors who brought the total number of volumes up to 328 by 1739 when the first catalogue seems to have been compiled. There are 39 donors in all, most giving only one or two volumes. Joseph Ayres of Pilton donated 67 volumes and John Lovering, merchant, one of the executors donated 21. Two other merchants were also among the most generous donors, John Clerk of London (12 volumes) and Richard Crossing of Exeter (ten volumes). Other donors include several clerics, the master of the Grammar school, three medical doctors and a number of women, including Mary Downe, who donated 14 volumes. The library holds many volumes which were old even when they were donated, including three incunabula, two of them works by William of Ockham published in Lyons in 1494 and 1495 and 73 volumes published in the 16th century. (Dodderidge 1909). An analysis of the various libraries shows many common features. In the tables below the breakdown of numbers of imprints by date is based on Evans and the percentages of titles in English and books published in England are based on the earlier printed catalogues. All show a high proportion of books in the classical languages, normally Latin, but this proportion decreased progressively during the later 17th century. The proportion of books published outside England also fell. The proportion of Latin books was similar in personal libraries of those who had enjoyed a university education. In 1699 the library of John Saunders schoolmaster of Tiverton was sold by auction at the English Free-School in that town after his death. He had amassed a considerable collection of some 750 volumes of which only about one third were in English. The dates and place of publication are not given in the catalogue so that further analysis is not possible but beside the expected theological writings and classical texts there are a number of titles of more general interest, such as Moxon's Mathematical dictionary and Dryden and Lee's plays. He also owned a copy of James's catalogue of the Bodleian Library. (Saunders 1699). The high level of foreign imprints in these parish and private collections shows a reliance on a book trade which must have had extensive international links; it is certainly a much higher proportion of foreign titles and non-English material than most libraries collect today and speaks eloquently of the learning of that section of the Devon community. It also hints at a divide between those who had mastered Latin and the more general public. Certainly there was no need for knowledge of Latin for those who wished to follow the current controversies of the day. While over half of the 17th century books in Newte's library were in Latin, he also had, bound in 16 volumes a total of 329 tracts published between 1603 and 1709. Of these only about three were in Latin. (Chalk 1905). A detailed insight into the way in which one Devon squire built up his library is provided in the case of Richard Coffin (1622-1698). The Coffin family owned the manor of Portledge in the parish of Alwington near Bideford where Richard lead a generally uneventful life, probably never leaving his native Devon. His brief moment of glory was forced on him in 1685 when he was nominated sheriff of Devon at the time of the Bloody Assizes. By 1687 he had lapsed back into rural obscurity and was able to devote himself to his main interests, genealogy and history. He collected many local pedigrees and corresponded with a wide range of scholars, including the historian John Prince who wrote of him in his Worthies of Devon that 'he hath a noble library & knows to make use of it". Like many other squires in the depths of the country he was dependent on London agents or friends for a wide variety of services. It is in 1687 that Richard Lapthorne enters the scene. He was Coffin's London agent for the purchase of books, and occasionally other luxuries, as well as retailing the news, in a series of weekly letters that survive largely intact from 1687 to 1697. Lapthorne's background is uncertain. He originated from south Devon and seems to have shared Coffin's tastes. He cared little for works of literature but like Coffin had a keen interest in antiquarian matters and divinity. Each week he would forward the Gazettes, and supplement these with gossip of his own, dwelling on the lurid details of crimes and giving weather reports, describing royal events or retailing scandals of the day. But whatever the news of the moment, it was firmly relegated to second place in Lapthorne's letters. First and foremost he would render an account of his quest for books to fill the shelves of his employer's library. Unfortunately much of this detail, which mentions some 250 books and pamphlets, has been omitted from published editions of the letters (Lapthorne 1928, Historical Manuscripts Commission 1876, 378-86). The originals are held in the Devon Record Office (Z19/40/3-6). One of his earliest letters, dated perhaps 17 December 1687, contains a lament at the high prices fetched at auction: 'The manuscripts being sold this weeke there is got for you only the Visitation of Devonshire don by they say a man of fame. it cost 30s. A Dorsetshire gent bid 28s. The manuscripts went at an excessive rate there being a throng of quality to buy.' At various times he promises to buy carefully at auction and on 9 November 1691 he purchased no fewer than 60 lots for Coffin. At times his interests reflect Coffin's legal activities. On 12 May 1688 he promises to send 'the latest and best edition of Dyer's reports which cost 23s.' On 17 November he writes: 'This day as I am informed came out a proclamation for the putting off of Exeter Faire but I did not see it.' A grimmer reminder of Coffin's attendance at the Devon assizes is found on 28 July 1688: 'Judge Rotheram is gon the Oxford circuit and tooke one Mr. Burgess an nonconformist minister with him as his chaplain. This Burgess is a man of extraordinary ripe parts and before the circuit hee was wished by the judge to penn a short tract for instruction and admonition to such criminalls as should be condemned in order to their preparation for death to bee distributed by him as there should bee occasion. It is a little book printed but of 2 sheets of paper and truly I think it accurately don for so few words. The price 2d. And I could wish you to take a half dozen. They may one tyme or another bee of use to some in extremity." Lapthorne was single-minded in his pursuit of books. As William of Orange was advancing on London after landing in Torbay in November 1688 he was reassuring Coffin that a collection of tracts from the bookseller Chiswell would be prepared for sending within a week and reporting on his attempts to knock down the price of a copy of Kircher's Parallela Latii in Littlebury's shop. His purchases were dispatched to Devon at intervals, as his letter of 2 June 1688 shows: 'I have just now sent to Exeter the carrier two large boxes directed to you at portledge in which are your bookes and a periwigge the perticulars of them you will see when I send your bill which I suppose you will receive by the tyme the boxes come to your hands.' Coffin's appetite must have been whetted by the regular reports with their promises of books, but Lapthorne's devotion bore no lasting fruit. The 1801 sale catalogue of the Portledge Library indicates that little was added to the collection after Richard Coffin's death in 1698. The 4,515 items sold by Dyer were predominantly in Latin with works on divinity and antiquarian topics especially strongly represented. The works of literature, which include two copies of the second folio of Shakespeare and works by Chaucer, Spenser, Donn, Johnson and Lyly, are largely early editions and may have been collected by a previous member of the family. More recent authors, such as Dryden, are not represented. Coffin attended the assizes in Exeter twice a year and would have had ample opportunity to visit the booksellers there. Indeed letters from the Exeter bookseller Walter Dight in 1682 and 1683 do survive among the Portledge papers (DRO Z19/40/8b folder 5). It may seem surprising therefore that he should have placed such reliance on his London contact. However the requirements of Coffin could not easily have been met by the Exeter trade and Treadwell (1997) shows that Lapthorne was a prominent figure in the London trade, a freelance dealer in books and manuscripts with a storehouse of books at Lyons Inn in 1694, and a major consignor to several auction sales. He is known to have supplied a wide range of customers and knew all the leading members of the antiquarian trade, even having contacts with "an ingenious man yt hath taken paines to keep an alphibitical register register of most books & prices yt have been sold in our London auctions" (24 September 1622). He also took care to forward the quarterly Term catalogues of recent publications. All in all he provided an expert service and knew his way around the book trade in the capital. Table 2. Proportions of books in English and printed abroad.